Its, with NO apostrophe, is a possessive adjective. My ball, Your ball, Its ball. The dog is playing with its ball. We use ITS… when we are talking about an animal or thing. It’s, with an apostrophe, is a contraction of it is or it has. The dog is not eating my food or your food. The dog is eating its food. Instead of saying THE DOG, we can replace the subject THE DOG with the pronoun IT. It is eating its food. 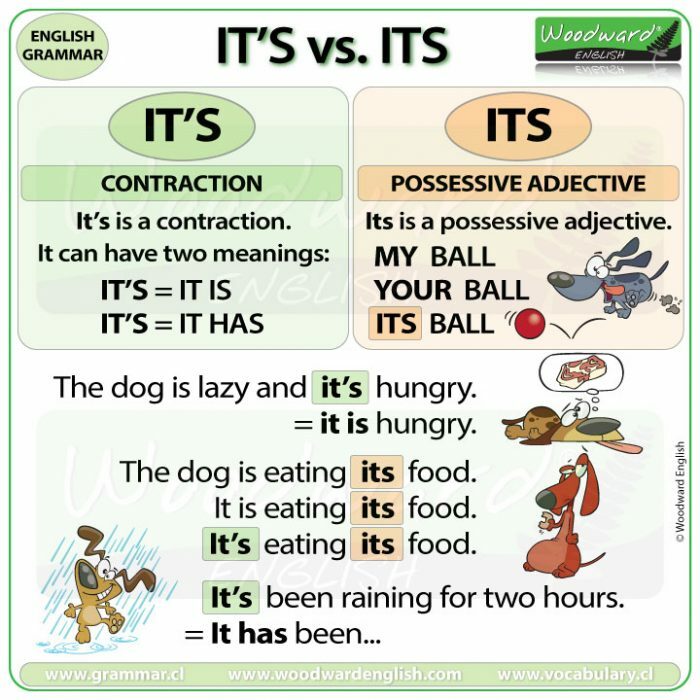 The first IT’S is a contraction of IT IS … and the second ITS is a possessive adjective. Its is a possessive adjective. A possessive adjective is used before a noun to show possession. Its belongs to the pronoun it. Remember IT is used for animals and things. The dog has a ball. Its ball is red. We want to show that the ball is a possession of the dog. We use Its because a dog is an animal. MY is the possessive adjective of I. – My ball is green. YOUR is the possessive adjective of YOU. – Your ball is blue. ITS is the possessive adjective of IT. – Its ball is red. It’s is normally a contraction of It is. It’s can also be a contraction of It has. It’s been a productive meeting. Notice that after It has, we use a past participle (finished, taken, been). We will learn more about past participles and the perfect tense in another lesson. How do we know if IT’S means IT IS or IT HAS? It depends on the word that comes next. It’s = It is … is normally followed by an adjective. It’s = It is … can be followed by a verb ending in -ING. It’s = It is … can also be followed by a noun. It’s = It has … is normally followed by a past participle. Chile is famous for its wine … and its earthquakes. Take an umbrella because it’s going to rain. The cat is licking its paw. How can I remember the difference? Replace the word with IT IS. If it sounds correct then IT’S is correct. If it doesn’t sound correct, then you need to use ITS. The dog hurt it’s feet.